Located near the Taipei Main Station where access to the rest of the island is a breeze, Flip Flop Hostel aims to meet two of the most important requirements of all backpackers visiting Taiwan: immediate access to public transit and a clean, warm, and welcoming space. Not only is public transit (main station of train, bus & metro) just a short five minute walk away, we are also just one street away from the Museum of Contemporary Arts. We also hired a local artist to help us transform this old railway workers’ dorm building into the unique, yet cozy space you see today. 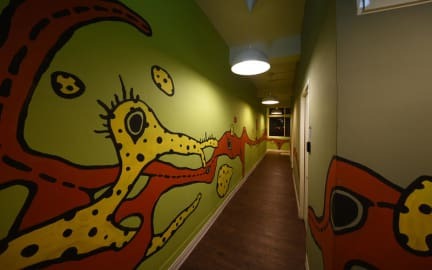 Our hostel is looked after with love and care, includes free WiFi, public kitchen space, fresh ground coffee machine, and has a 24hr, openly accessible lobby to support your travel experience around the clock. We also feature free additional storage and coin-toss washer and dryers to ease the minds of the adventure-minded. Movie theatre, shopping mall, and supermarket is easily accessible right upstairs from closest MRT station. Head west for a short 10min to check out the century-old historic Taipei North Gate, north for the gourmet Ningxia Night Market, and take a five minute MRT ride to visit popular Ximending. Easy access to these local food and entertainment destinations ensures that all our patrons won’t go hungry and bored. But most importantly, Flip Flop Hostel is owned and maintained by backpackers like yourself. With love and care, we welcome all travelers to stay and share their stories in comfort. * All of our dorm rooms are equipped with FREE Wi-Fi, air-conditioning, cooling fans and lockers. Great location, well designed rooms, friendly and helpful staff made this a really good place to stay in Taipei. Great place, great location. Staff was kind, other travelers were fun, and the facilities are lovely. Only criticism is that the bunks didn't have curtains, which would be an easy but valuable upgrade. What a lovely place!!!!! The staff is incredibly helpful and friendly, it's in the best possible location - a few minutes walk from Taipei Main Station, it's clean, secure, well decorated... This place is amazing. When I was back in Taipei for a day they let me keep my luggage there for free even though I wasn't staying at the hostel anymore! It's also a great place to meet friends. I would stay here anytime I'm in Taipei!!!!!!!!!!!!!!!!!!!!!!!!!!!!!!!!!!!!!!!!!!!!!!!!!!!!!!!!!!!!!!!!!!!!!!!!!!! good location next to Taipei Main Station. Good clean facilities. It is a nice place to stay for a good price. Staff is super friendly and very helpful. Though you see only a few hostellers in the lobby hanging around, the free tours organized by the hostel are a great way to meet other people and hang out. I joined the night market tour and it was super fun and got to meet many new people. Location: It is near the Taipei main station and only 5mins walk away. 7/11 is right beside the hostel. So don't have to worry about late night hunger calls for food. Perfect location and very clean. You would love the staff because they are very friendly and accommodating. Two thumps up for me. Perfect location, super friendly and helpful staff, nice common room... BUT the rooms are kind of noisy -- the walls are thin and the sound of the namesake flip flops banging on the hard wood floors in the hall can make it hard to get an early sleep. Also, if you're bothered by traffic noise, the hostel is right next to a major road. This was a big problem for me (I'm a light sleeper), but otherwise, great place. Super clean bathrooms, too. Really nice and friendly little hostel just round the corner from the main station. Well placed for exploring.